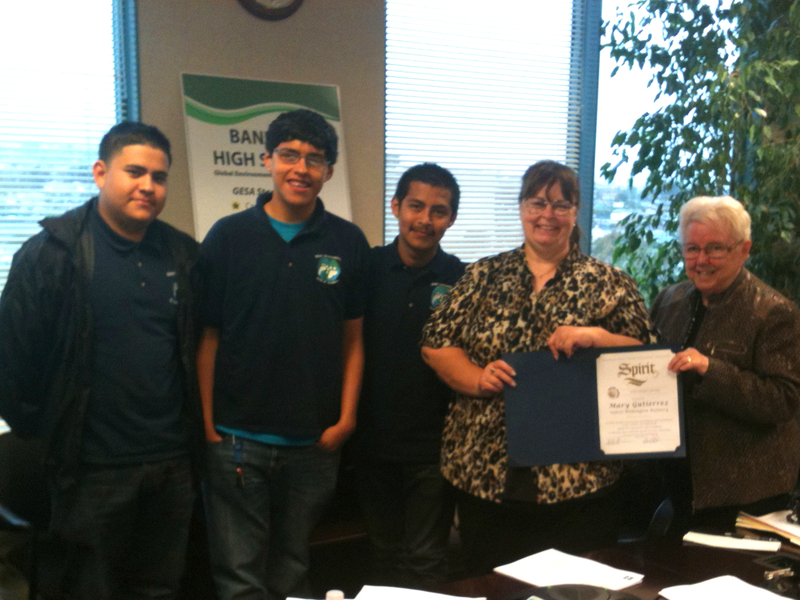 ITEP is proud to present Reuel Herron, Branch Manager of Desert Community Bank in Barstow, with the ITEP Spirit Award, in honor of his outstanding contributions and commitment to the students and staff of the Mojave X-Press Logistics Academy (Mojave XP) at Barstow High School during 2010-2012. 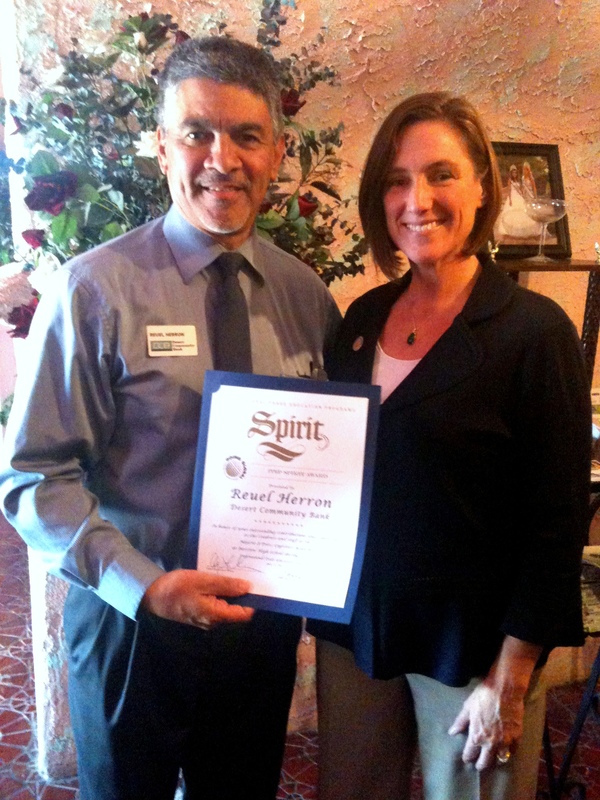 Reuel has been a very active member of the Mojave XP Advisory Board for the last two years, and, in addition to participating in the monthly advisory board meetings, he was also one of the first Coaches in the monthly Industry Coaches mentoring program for Mojave XP juniors this year. For the last two summers, Reuel opened the doors of the Desert Community Bank for the Advisory Board Summer Planning Sessions, and has supported other on-campus and off-campus events. It is clear that he cares for the academy students and staff, and he will be missed as he leaves for a new position out of the area. All the best to you, Reuel! At the meeting, we welcomed Rosella Bernal, new VP/ Branch Manager for the Barstow Branch, who will represent Desert Community Bank on the Advisory Board – thanks, Rosella! 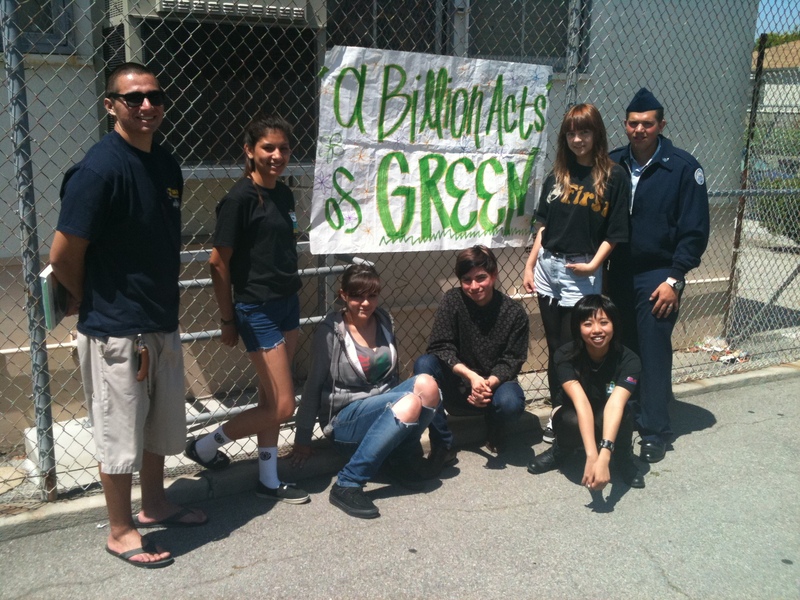 The students and Advisory Board members from the ITEP San Pedro Earth Alert Academy (SPEA) at San Pedro High School, celebrated the 42nd anniversary of Earth Day on Friday April 20, 2012, with on-campus presentations and demonstrations that generated interest and awareness for the “Green Generation.” More than ever before, young people are getting involved by taking steps in their schools, homes and neighborhoods to protect the environment by recycling plastic bottles and aluminum cans, volunteering for coastal clean-ups, and exploring the possibility of entering into green careers in the future. 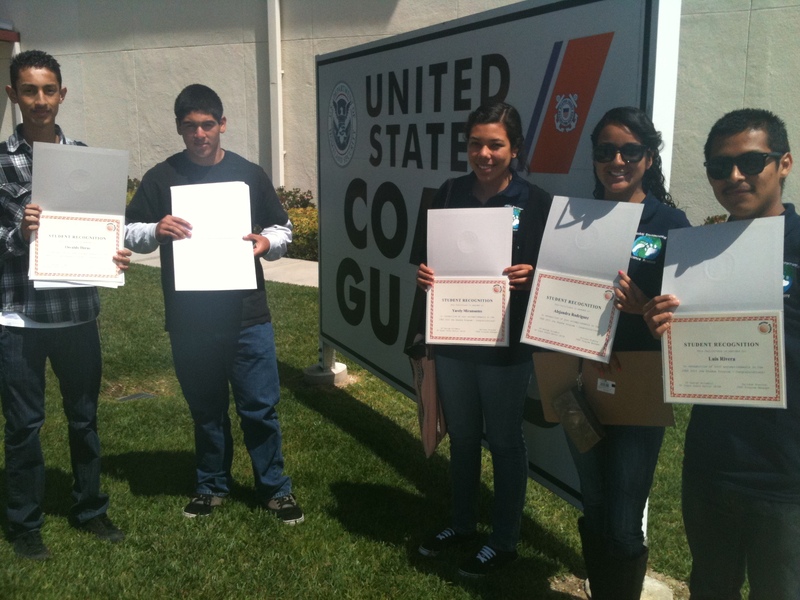 To celebrate this event, 10 members of the US Coast Guard Base on Terminal Island, gave presentations that showed students the importance of their missions in the protection and stewardship of natural resources by eliminating environmental damage associated with maritime transportation, fishing, and recreational boating. More than 45 presentations and demonstrations during the day gave students a wide range of topics and points of interest to consider. Guest Speakers from local organizations included Advisory Board Chair, Mike Schaadt, Cabrillo Marine Aquarium Administrator, who, along with two other scientists from the aquarium, gave presentations on “Careers in Marine Biology and Oceanography,” as well as displaying a live grunion lab for students to interact with. 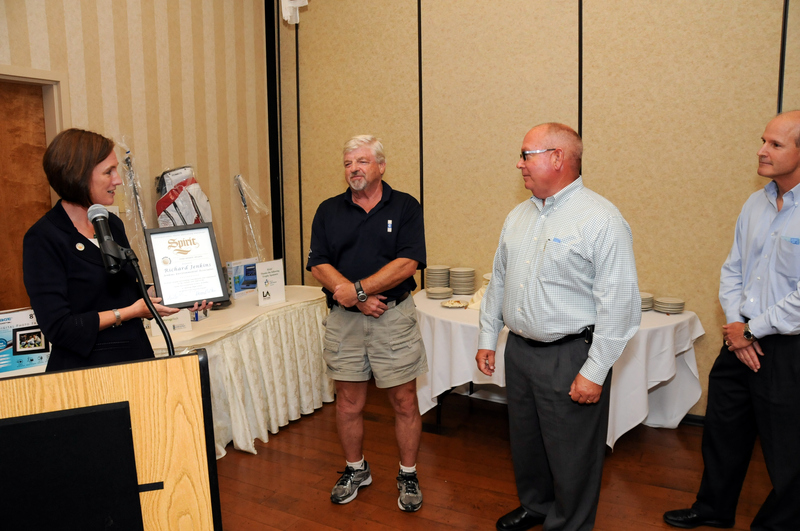 Pax Bowman, an ITEP Partner from West Basin Container Terminal (WBCT), presented the “Enviro-Jeopardy Game,” modeled after the television game show. Students showed how much they knew in areas including:Earth Day, Recycling, Port Related Environment, and What Not to Do. Student teams became very competitive with each other, and were quite involved in capturing the most points to win the game. In addition, Nancy Felix, from SA Recycling, spoke to students about “Careers in Environmental Management,” and had a presentation about how SA recycles scrap metal. Attorney Vivi Heger spoke on Environmental Law, and Dr Raymond Wells presented a community college approach to Programs in Marine Biology. Student Council members were able to secure more than 200 signed commitment cards during the day-long event, with students having the opportunity to complete written pledges for “A Billion Acts of Green,” Earth Day’s way of mobilizing the power of people to create change by taking small steps. 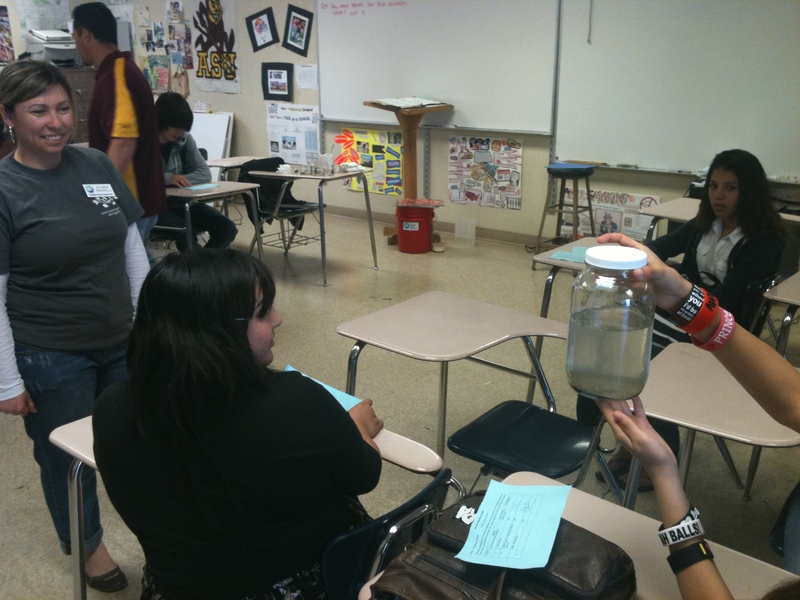 Each student was encouraged to write down at least one thing they would do to help protect the environment. The statements made by these high school students, show how much they care about the environment, and what they plan to do to help. I wonder how many of us can pledge the same things that these high school students have? “I will try not to leave trash anywhere so it doesn’t lead to our oceans or pollute,” said SPEA student, Juan G.
“I will reuse and save my bottled water…I also pledge to carpool to school,” R.C. “I will use the bag I was given at thestore and that will help save plastic bags,” D.A. wrote. “Grow more plants!” What are the rest of us willing to do? Students spend spring break preparing for their future! Spring Break for students has become synonymous with “partying.” Scenes of young people in bikinis and shorts, playing in the sand, and staying up all night are not unusual. This year, spring break means something different to 30 ITEP students, who have decided to PREPARE for their future, rather than PARTY. 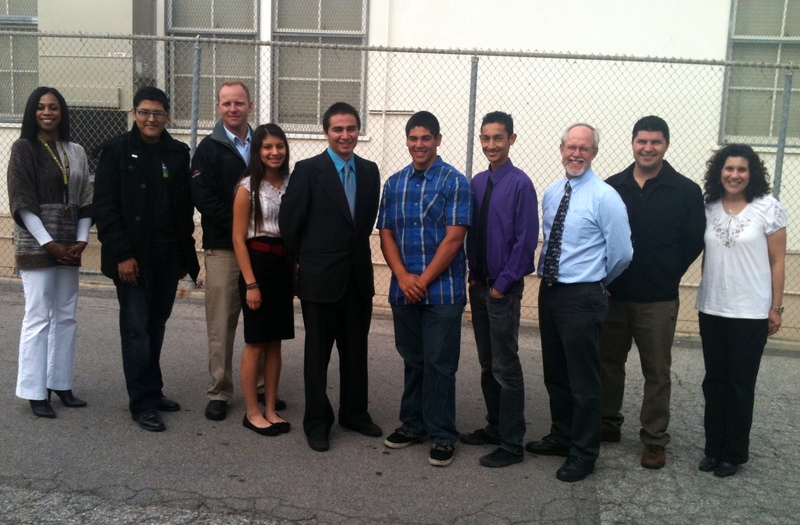 Through the new ITEP Job Shadow Pilot Program, students from GESA at Banning High School, SPEA at San Pedro High School, and GBAC at Carson High School will have a first-time experience at ITEP’s Industry Partners’ facilities to discover some of the career opportunities that are available locally, and to see the skills and experience that is expected in a professional environment.” We wanted the students to be actively engaged so that they can learn firsthand what it takes to succeed in these industry settings,” commented Harlene Stanley, ITEP Program Manager. More than 50 juniors competed for the 30 limited spots overall at the three academies. Students were selected based on how well they completed the job application process including cover letter writing, resume preparation, interviewing and professionalism. 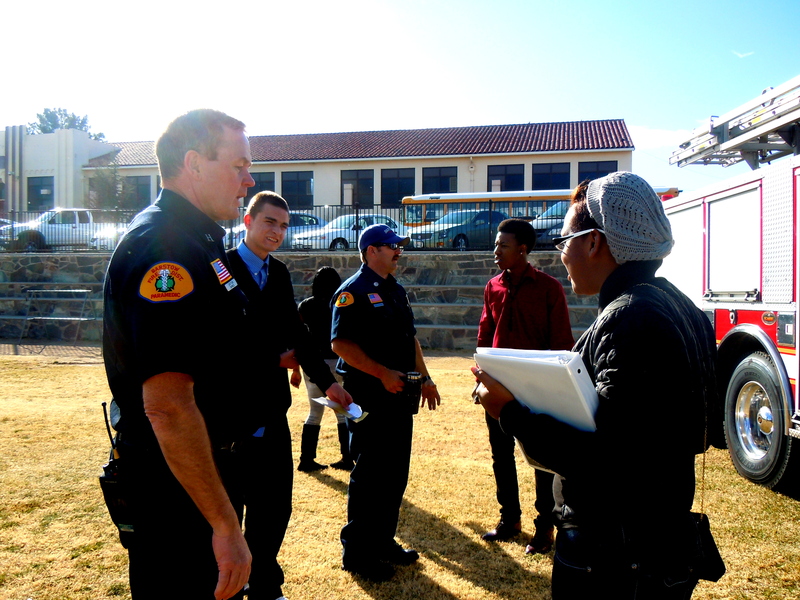 For GESA juniors, each completed three Employment Preparation workshops for the LA Youth at Work Certification Program (Resume, Job Application, Interviewing Skills). GBAC and SPEA juniors each completed four on-campus Employment Preparation workshops (Resume, Cover Letter, Job Application, Interviewing Skills), with workshop materials developed by Harlene Stanley. The selected juniors will be shadowing at some amazing companies: GESA students will be shadowing a Calscience Environmental Chemistry Laboratory, Valero Refinery, SA Recycling, or the US Coast Guard. GBAC students will have their “shadow” opportunities at Shell Pipeline, NYK/Yusen Logistics, Watson Land Company, or Custom Goods Logistics Warehouse, Distribution and Transportation Services. SPEA students will have their “shadow” time at Cabrillo Marine Aquarium, US Coast Guard, West Basin Container Terminal (WBCT), or JMC2 Civil Engineering. All selected students will receive 5 hours of community service, which is a requirement for academy graduation, and will develop and submit a report on their job shadowing experiences – detailing the skills necessary to succeed in these careers. They will also have the opportunity to see how high school helps pave the way for their goals, and how additional education can help them to achieve even higher possibilities. 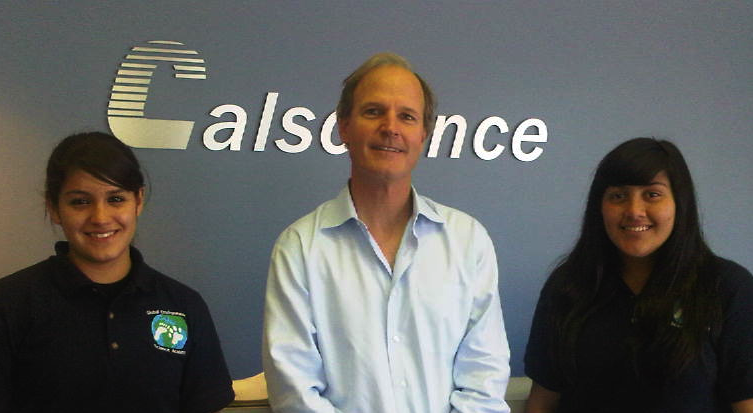 This has truly been a team effort between ITEP, ITEP academies and ITEP industry partners to develop this program. We look forward to this becoming an annual event for juniors to give them this “real-world” experience, and encourage them to graduate, be job-ready and college prepared! Stay tuned to hear what ITEP’s industry partners though about the program and what the students learned through their experience! 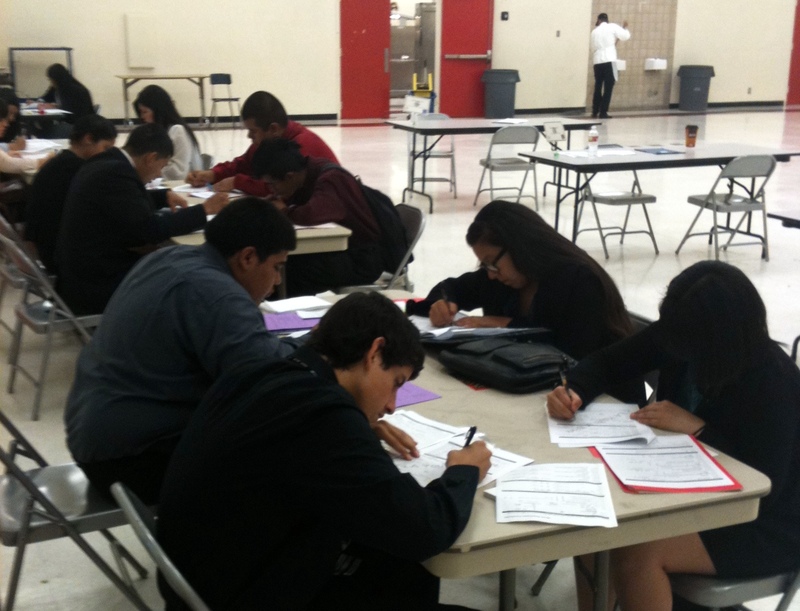 Mojave XP hosts third annual Career Fair! 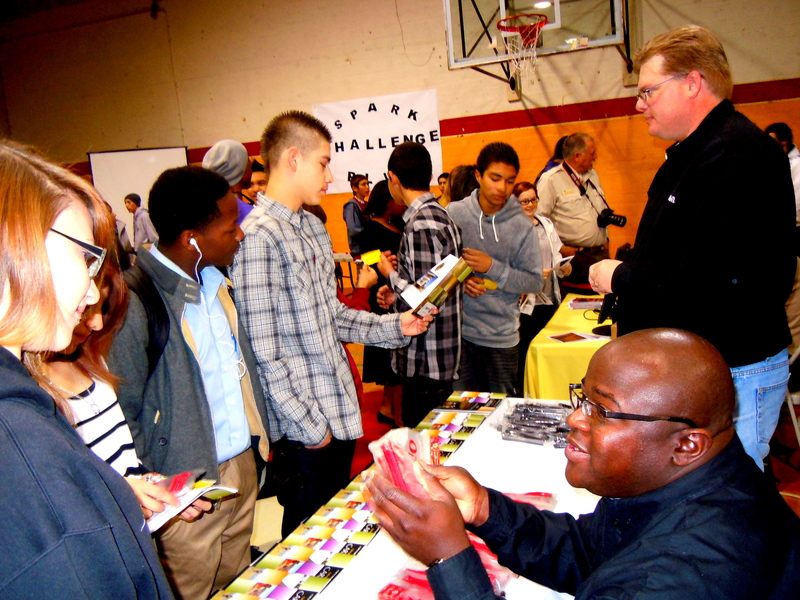 Mojave XP Academy hosted its third Annual Career Fair on Tuesday, January 31, 2012, in the gym at Barstow High. 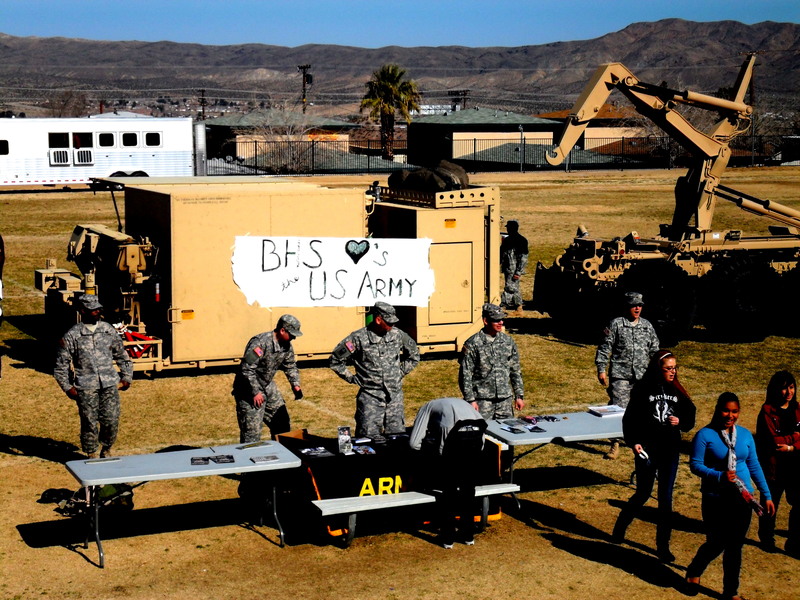 With the United States Marine Corps, Army, and Navy in attendance, as well as ITEP Business Partners Barstow Community College, BNSF, Borax, and other local businesses and organizations, the students learned about various job opportunities and career options available in Barstow. This year, in addition to the school’s 1,400 students, 60 visiting students from Central High School were able to meet with 20+ vendors and learn about local job opportunities and career options. 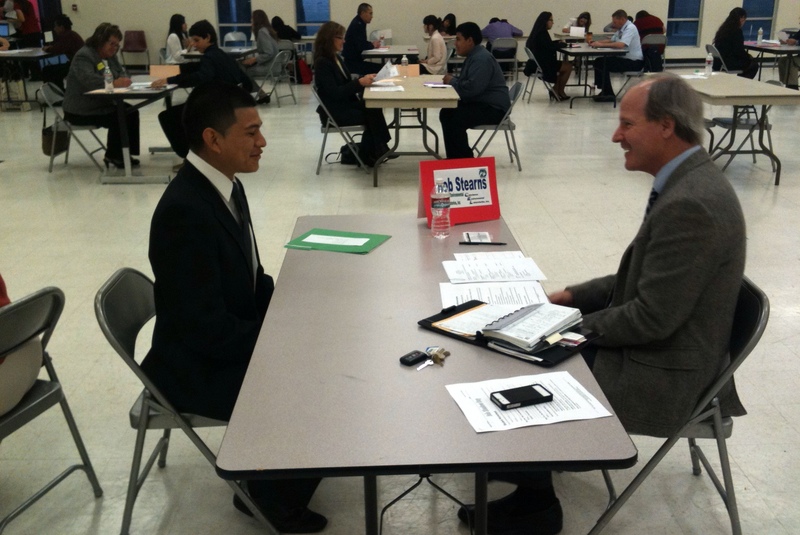 Students also had the opportunity to do mock interviews with business representatives. Thanks to the students, teachers, administration, and support staff behind the scenes for making Mojave XP’s 3rd Annual Career Fair a success!